In his book, The Myth of Religious Violence, Cavanaugh attempts to address false assumptions about the dichotomy of religion and secularism, particularly in how they are perceived in accordance with violence. 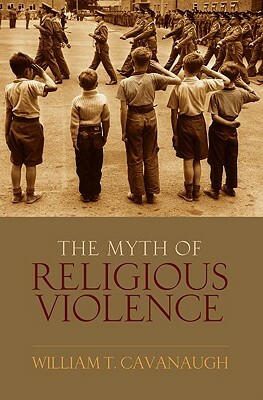 The myth of violence he says is “the idea that religion is a transhistorical and transcultural feature of human life, essentially distinct from secular features such as politics and economics, which has a peculiarly dangerous inclination to promote violence.” Religion, because of this dangerous inclination, must therefore be tamed by restricting its access to public power. The secular nation-state will then appear a natural result, responding to the inherent dangers of religion. First, I’ll outline a few of Cavanaugh’s points and then add some brief responses. Cavanaugh says that he is not set out to argue that religion either does or does not promote violence, but rather to analyze the political conditions under which the very category of religion is constructed. And this category has been constructed as violent, irrational and fanatical. He argues that so called secular ideologies and institutions like nationalism and liberalism can be just as absolutist, divisive, and irrational as those called religious. Claims about the violence of religion are centered on the assumption that religion is theoretically separate from secular realities like politics and economics. The myth of violence, therefore obscures the pursuits of the state. The nation-state has become a new kind of religion, appropriating the holy from religion itself to justify its own purposes. In the context of international affairs and foreign policy we can see how this plays out. If religion has a peculiar tendency to promote violence then societies that have learned to tame religious passions in public are seen as superior and more inherently peaceable that societies which have not. Policy follows suit. Cavanaugh’s stance is in defense of religion. He seems to adopt a radical defensiveness that the religious right seems to adopt for itself. Their tradition, their way of life, their beliefs are under attack by the liberal media, by the government itself. This completely denies the reality of how powerful religion is a force in public life. Yes, prayer is not allowed in public schools, yes abortion is somewhat legal but these are not closed issues, the debate rages on with intense vigor from the religious majority. The term “under God” is in our national anthem, “In God We Trust” is on our currency, the 10 commandments and other religious displays are present on public property like courthouses. Again, these are not closed issues. But the point I am making is that the religious voice in this country is not oppressed. A liberal, secular majority that sees them as being fanatical and dangerous is not controlling them. If that were the case, the powerful religious presence in the Republican party would be nonexistent. Cavanaugh also uses a reductionist view of religion. The idea that religion is a label created, through the enlightenment, by the secular state, in contrast to secularism is absurd. Religion serves many more functions that those as defined in its contrast to secularism. This however will be a point I elaborate on much further when I discuss Ken Wilber. For now, lets say that his use of the term religion lacks depth. Cavanaugh claims also do not invalidate the fact that religion is, or can be, absolutist, divisive and irrational. And as such, it warrants a certain response to these tendencies that are indeed rational! Furthermore, he seems to equate all forms of violence; that all forms should be subject to the same quantity and quality of scrutiny. While this sounds great it denies the fact that not all kinds of violence are equally dangerous. Religious violence is simply more dangerous because it is irrational and has no empirical basis for its claims. While secular violence must have a certain level of rational justification for its actions. This quality alone differentiates these two forms of violence. Nation-states do not serve the same functions as religion. To equate the two is just silly. However similar they may be in creating in-groups and out-groups and providing meaning through ideology and symbols, they do not make any claims for absolute truth, build churches, provide a system of beliefs and practices for salvation or repentance or provide supernatural meaning. In this way, Cavanaugh’s claim that secularism is a new religion is absurd and inaccurate. However, the myth of religious violence, the idea that the dichotomy of the religious and the secular, may causes us to ignore or deny secular forms of imperialism and violence and it warrants our attention. However, it should not be used in a way to justify or defend or invalidate religious violence as a primary concern for human life and international affairs. Religious violence is real and problematic and “doing away” with the myth of religious violence will not bring to light secular forms of violence any more than a variety of other means would, such as politics, activism international law and humanitarian networks. Nonetheless, it is a great book with a truly revolutionary contribution to the field of politics, religion and international affairs.